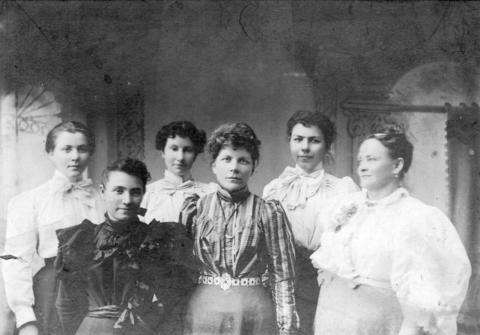 Item : CVA 371-770 - "A Group of Ladies of the Old Huntingdon Hotel"
Notes on back are: "Front row - Mrs. Schieber (Reirson), Sumas, Wa; Mrs. Moulton, deceased; Mrs. Julia York, operated C.P.R. coffee stand at Huntingdon Depot. Back row -Artie Nims, Vancouver; unknown and Mrs. McCormack (Teena McGregor), Vancouver"